The Tour Group consisted of seven field agents with the University of KY Extension Service. Also included in the group was an employee of the KY Dept of Energy, Office of Mine Safety & Licensing, and the Big Sandy Community and Technical College. The Tour Group visited the D&D Cattle Ranch, located in Perry County, KY which is a working ranch that was developed as the post-mine land-use purpose after the coal located at the site was removed through the Mountain-Top Removal Mining Method. Ranch manager/operator, Mr. Larry Clay explained the history of the Ranch and its operations to the Tour Group. The Challenger Learning Center of Kentucky, located on the campus of Hazard Community and Technical College provides NASA related programs for students in 4th- 8th grades that emphasizes the importance of the disciplines of science, math, and technology. The Tour Group visited the center and saw a presentation on the different programs the Center offers, including the Mars Invasion 2030-From Coal Camp to Space Camp Program, designed for fourth grade students. The Mars program illustrates many of the similarities between the Space Program and the Coal Mining Industry, as well as many of the job skills required to be either an Astronaut or Coal Miner. 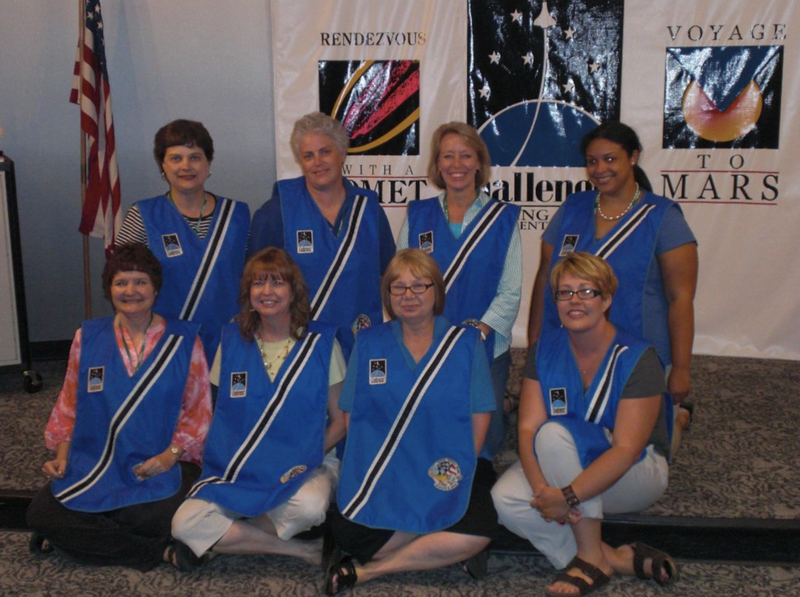 The picture shows members of the Tour Group with NASA vests on which are used by students participating in the Space Simulator program. The tour participants go through a Safety Orientation prior to going underground at one of TECO’s Perry County Coal’s mines. The group viewed a forty-five minute video familiarizing them with the mining complex, followed by instructions and hands-on experience with using the Self Rescuer apparatus, which all individuals are required to have on their person when entering an underground mine. The group suits-up for the trip down-under! 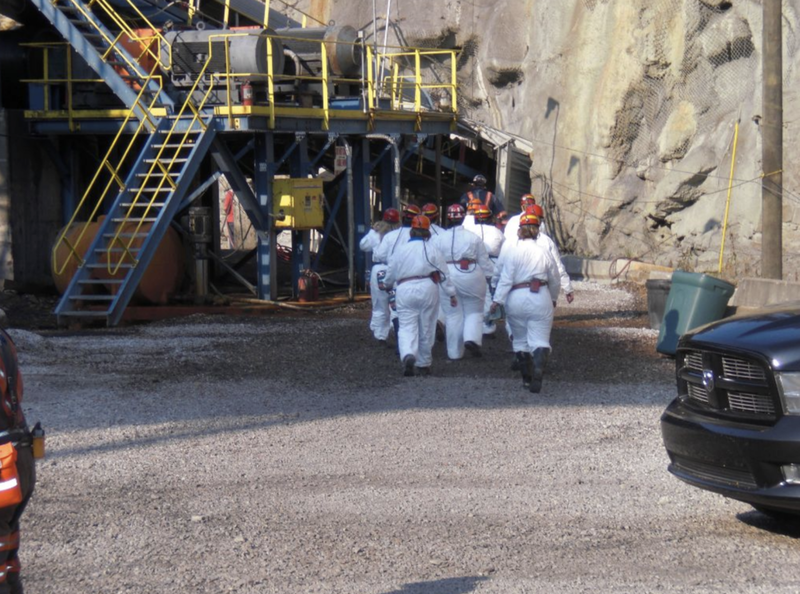 Participants head for the man-trip for the ride into the mines. The last stop of the Tour was at the Appalachian Regional Reforestation Initiative’s (ARRI) test site located at the former Star-Fire Surface Mine complex near the Perry/Breathitt County border. The tour began with lunch at the Goose Pond picnic shelter with Mr. Paul Rothman and Dr. Don Graves explaining the history of the reforestation project and its current status. The group then proceeded to the first in a series of test sites where they received information relating to that particular cell and how it was different from the subsequent cells. This was followed by a walking tour of several test cells with a stop at an outdoor classroom site. The participants learned how the different species of trees grew so big in a relative short period of time, thus the core of the Reforestation Program. *NOTE* Dr. Don Graves is the retired Chairman of the University of Kentucky’s Department of Forestry, and is widely known as the founder of the Reforestation Initiative in the state of Kentucky. Mr. Paul Rothman is the state’s Chief Environmental Scientist and works out of the Commissioner’s office of the KY Department of Natural Resources. Mr. Rothman has been involved with the Reforestation Initiative in Kentucky since the beginning of the program along with Dr. Graves.